With the 3 year cycle up for home and away jerseys the Warriors adopted a new home jersey. For the first time in the clubs young history the home and away jerseys wouldn't have a chevron, not even a stylised one. 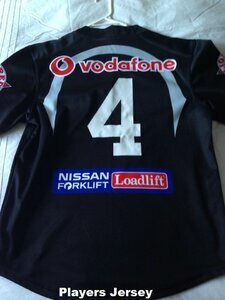 Also for the first time the Warriors would welcome a lower back sponsor to the clubs stable in Loadlift. 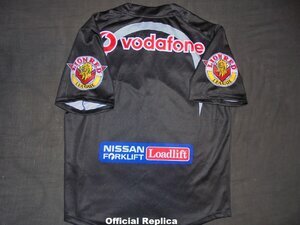 OFFICIAL REPLICA - As with all new design home jerseys this jersey sold quite well and is fairly common. You can pick one up for $50 at times. 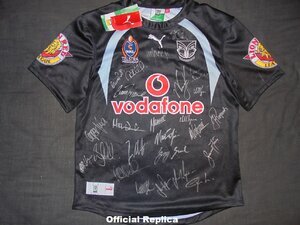 Even signed jerseys dont fetch much more than the price of a new season jersey. Just be aware that the sizing is smaller then previous Puma jerseys but smaller than the CCC range. 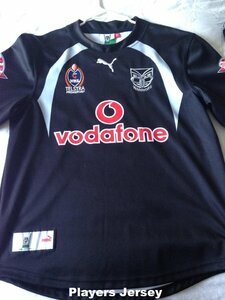 PLAYERS JERSEY - Exactly the same as the replicas but with a white number on the back.